Your journey into Star Wars™ Battlefront™ II began last month, but the true trials lie ahead. 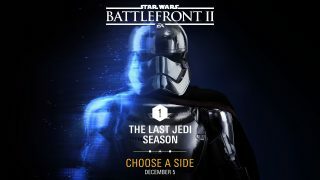 With The Last Jedi Season hitting the game, you’ll be asked to make a choice: will you reclaim the Imperial legacy with The First Order, or side with the Resistance as they strive to keep the galaxy free from oppression? This question’s not a trivial matter, either. It will be presented to you in-game the next time you play, allowing you to side with the faction of your choice, a decision which will follow you for the remainder of Season One. Make your way to the Career tab and you’ll notice new Challenges that are tied to your faction. Completing these will not only reward you with Credits and Crafting Parts, but help edge your faction closer to victory, giving all members of that side additional rewards. The other faction will get a Crate of their own with lesser prizes, but it will hopefully come with a drive to fight back even harder. Victory in the week is but one step towards overall success, and a bigger reward at the end of the Season. The first weekly Challenge will test even the most skilled combatant, tasking you with getting 50 kills with each trooper class. You don't need to complete it before the next Challenge is added, though; each new weekly Challenge will be added to your Career page, and you're able to complete them in any order. Just make sure you finish them before the end of the Season, otherwise you might miss out. This month will continue to be eventful with the release of free content inspired by Star Wars: The Last Jedi. 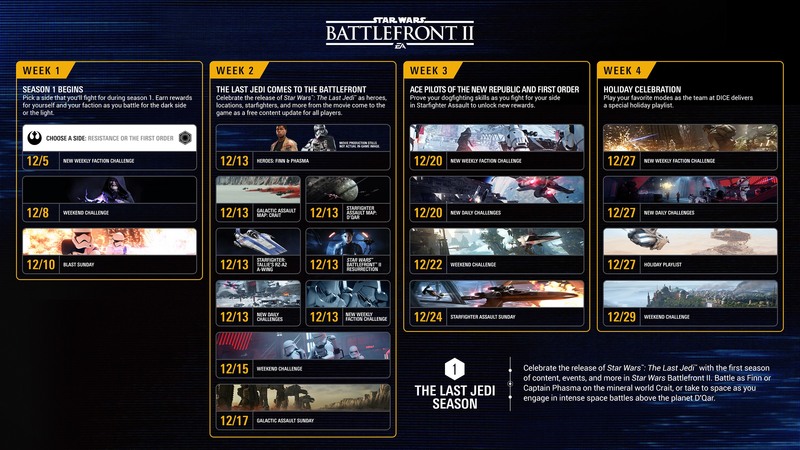 Finn and Captain Phasma will join into the fight for the Resistance and The First Order respectively, and you'll be able to battle across the Galactic Conquest map of Crait and Starfighter Assault battle of D'qar. Iden Versio's story will continue as well, with *Star Wars* Battlefront II: Resurrection releasing, free* for all players. This is only the beginning. Take your first steps today, and prepare for the full power of The Last Jedi Season as your Star Wars journey continues. Keep your eyes on EA Star Wars™ on Twitter, Facebook, and Instagram for much more of what’s coming to Star Wars Battlefront II.